I couldn’t think of a better beer to have on the first day of 2012 than the collaborative effort between Milton, Delaware’s Dogfish Head and Chico, California’s Sierra Nevada. Life & Limb is a 10.2% ABV (alcohol by volume) beer that has been bottle conditioned with Alaskan birch syrup to make it a living ageable ale, capable of being enjoyed ten, fifteen, even twenty or more years from now. But the collaborative effort is what makes this beer such a good story. This beer is brewed using a half-and-half mix of both Dogfish and Sierra Nevada proprietary yeast strains. Then, maple syrup from Dogfish CEO Sam Calagione’s family farm in Massachusetts is added, along with estate malts from Sierra Nevada, grown right in Chico. Life & Limb is packaged in 750 ml corked bottles, and the format is something to behold. 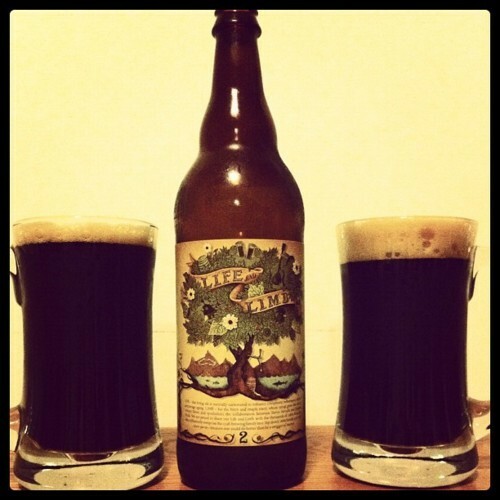 The artwork on the front of the bottle features a Sierra Nevada half and a Dogfish half, with two trees wrapped around each other. The inspiration for the beer comes from both Dogfish and Sierra being independent beer companies, free of the big macro boys, and instead of being competitors, honoring each other as partners who appreciate each others work instead of scoffing at it. Wouldn’t that be an excellent spirit to capture and foster more of in this new year? To honor people for being loved, instead of hated? Back to the beer… the version of Life & Limb I sampled came from the second batch produced. The first batch was made in the fall of 2009; my bottle comes from the mid-2011 brew. I’m not sure how limited the beer is, but I do know my local bottle shop only received two cases (24 bottles). Uncorking produced a satisfying pop, complete with a nice amount of smoke that slowly rolled out of the bottle. The pour made for an average size head, light khaki in color, atop a very dark beer with scads of carbonation bubbles rising to the surface. The body of the beer appeared very muddy; when held to a light, you could see particles and sediment floating throughout. Lacing was fairly sparse, with only a couple of small chunks sticking to the glass. The aromas produced by this beer are very atypical of a normal brew — up front, there’s a boozy oak presence, along with some smokey notes and a hint of vanilla. 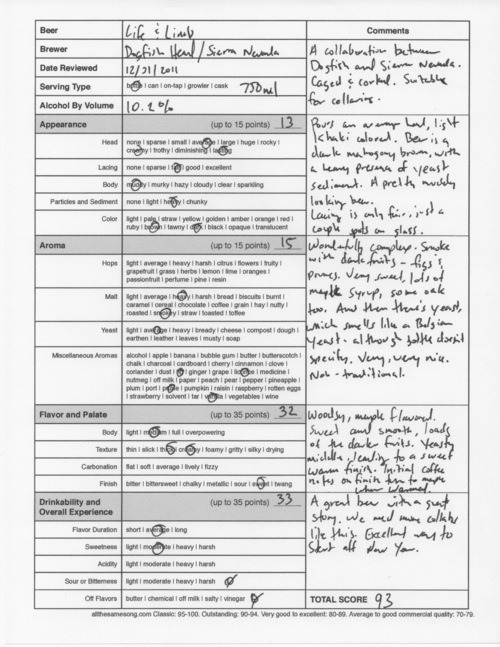 The yeast really stands out; you almost get that classic Belgian yeast funk going on. The scent is overall sweet and has small hints of several things: maple, licorice, and even darker fruits like fig and prune. To the palate, this one is very woodsy with the sweetness of the maple coming through. Despite the 10.2% ABV, the beer is very smooth and creamy, but it does have a nice warming sensation when swallowed. The middle of the taste has dark fruit and crisp yeast, very bright flavors that dull when going into the finish. I initially picked up some coffee notes on the finish, but as the beer warmed, it became more maple. Life & Limb is a great example of how extreme beer can be — while it does have the carbonation and mouthfeel of a beer, it honestly doesn’t taste like beer. The complexity of flavors and presentation are outstanding, and I look forward to seeing how this will age over the years. 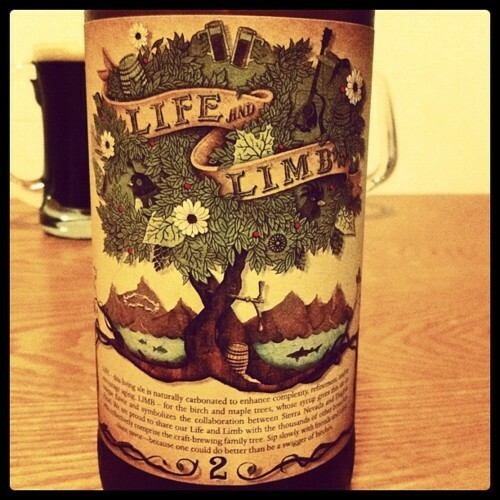 Dogfish Head/Sierra Nevada Life & Limb, 93 points. Price: $9.99 US for 750 ml corked bottle.